Is your Android Phone Overheating? If yes then you’re in the right place as we will be looking at the possible causes of the Android phone overheating issue and how to fix it easily. Android Phones have gotten more powerful over the last few years with some smartphone being able to handle some pretty demanding tasks, much like the PC. However, this brings along a new problem; overheating. The Android Phone overheating issue poses a great risk to your Android phone over time if nothing is done about it. A less likely scenario, although can possibly happen, will be your android phone exploding while you’re using it which can cause physical injuries. Your phone could also shut down by itself and refuse to turn on. Also, the heat generated by your phone while overheating can also cause the glue used in Making your phone to melt over time. Subsequently damaging the hardware. There are also a whole lot of stuff that happens to an android when overheating but it all comes down to damage the hardware of the Phone. So it fixing the problem should be of utmost priority. There are numerous reasons why an android phone might start overheating, and we will look at the possible problem and also state the necessary steps to take in order to fix it. Running more apps than your phone can handle simultaneously is usually the cause of the Android phone overheating problem. If you have too many apps running, then you should close them all and let the phone cool down. If there are no apps running your phone is still overheating then you might want to check apps running in the background and stop the unnecessary ones. You’d be surprised at the number of apps you have Installed that are running in the background. This should significantly reduce or totally stop the overheating as it reduces the workload on the phone, depending on how many apps you still have running after you’ve stopped the unnecessary ones. Android phones were not necessarily made for gaming. Although, it can be used for light gaming and also play some HD games. However, with big PC titles like PUBG and Fortnite Coming to Mobile, playing these games on your Android phone might not necessarily be a good idea. If you must, then I’ll suggest you get a gaming phone like the Xiaomi Black Shark or ASUS ROG, even the latter comes with a cooling system to combat this particular overheating problem on Android. If you are still hell-bent on playing those Power hungry games on your phone, then you should consider taking breaks in between gameplay to allow the phone cool down and catch its breath. If you’re using a phone case, then you’ll need to let go of the phone case. I know that phone cases make your phone look beautiful, and some often offer some kind of protection to your phone, but disadvantages far outweigh the advantage. This is because as the Android Phone gets hot, it generates heat. Now phone cases are mostly made of Plastic or leather which will only worsen the situation by keeping the heat inside. In some rare cases, the phone case seems to be the actual cause of the Android phone overheating issue. Best to let the phone get some fresh air instead of suffocating the Phone. By charge properly, I mean getting the right kind of Charger for your phone; an original charger from a reputable store. Charging your phone with a fake Charger can also cause your phone to overheat, although that only happens if you’re charging your phone and stop and cool down when you unplug it. However, if you notice that it ONLY overheats when charging, then you will need to change the charger As soon as possible before it completely damages your battery. 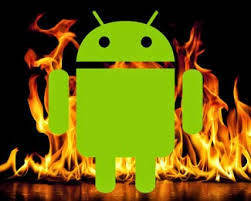 Malware, Spywares, and Viruses can also cause Android phone overheating. Some viruses are programmed to steal data; some others are programmed to keep installing different apps on your phone and so on. All these tasks will be carried out on your phone most times without your knowledge which will increase the pressure/workload on the processor and subsequently make your android phone overheat. To fix this, Download an antivirus from the Google play store and scam for Malware, Spywares, and Viruses. If you Find any, do not hesitate to delete them immediately. That should fix the overheating issue on your Android Phone. If your Android smartphone manufacturer has released an update for you, then you should probably update. The overheating issue might a software issue which has been fixed with the update so updating your phone might be all you just need to fix the problem. To check for updates, Go to Settings >> About Phone >> System Update >> Check for update. Turn of all connections when not in use; Bluetooth, Wifi, Data, Hotspot, etc. Turn Off Vibration for unnecessary apps. These are the best fix for your Android Phone overheating issue. However, if you have tried the above steps and your phone is still overheating then drop a comment down below telling us which phone you use, and we’ll figure out a solution for you.